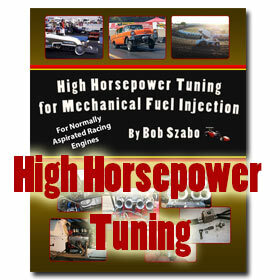 Recommended by Dave Smith, Sn, owner of Sacramento Raceway and a 260 MPH Nostalgia Nitro dragster. This publication contains valuable contributions from Gene Adams (Gene Adams Performance & nitro expert), Don Jackson Engineering (Top Fuel drag race & Bonneville race developer, engineer, & crew chief), Pete Jackson (Pete Jackson Gear Drives & nitro racing expert), John Stewart (Top Fuel nitro tuning expert), Rich Lavelle & T J Fitch (SSI Blowers), Patrick Hale (racing software developer & racing engineering expert), Jim Rehfeld & Kent Enderle (Enderle FI), Roger Gleeson (Joe Hunt Magneto), Roger Olander (PSI Superchargers), Glen Hutchison (Hutchison Racing drag boat record holder), Brendan Murry (Racecarparts.com), Tony Ruggiero (nitro Harley racer), Jim Kinsler & Earl Miller (Kinsler Fuel Injection), Steve Wallace (The Nitro Man), Gene Mooneyham (Mooneyham Blowers), and Jim Archer (Los Alamos National Labs). This publication also contains key technical & nitro info from sources such as NASA, the MSD Ignition Company, the Crower Equipment Co., NGK Spark Plug Company, Champion Spark Plug Company, National Weather Service, Airdensityonline.com, Angus Chemical, Dow Chemical, Combustion Research Facility (Sandia National Laboratories), Department of Mechanical and Nuclear Engineering (The Pennsylvania State University), Department of Chemical Engineering (Princeton University), Fraunhofer-Institut fur Chemische Technologie, Department of Physical Chemistry (University of Malaga), Journal De Physique IV, Toolingu, NHRA, IHRA, Drag Racing Magazine, and Hot Rod Magazine.